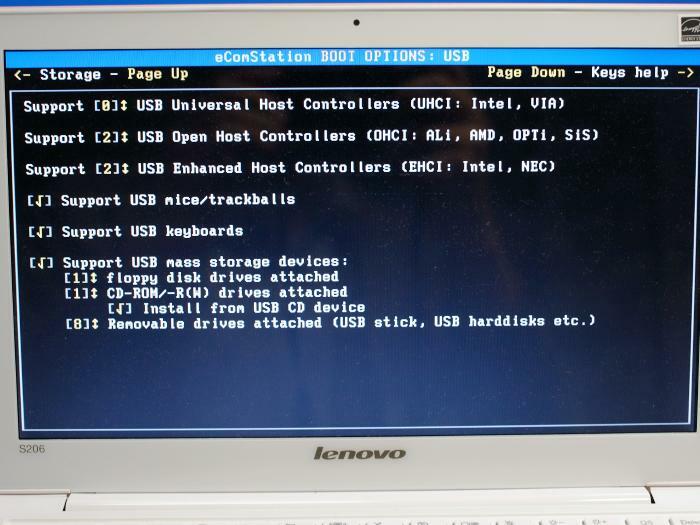 This simple tutorial shows you to use eComStation(eCS) 2.1 on Lenovo Ideapad S206. 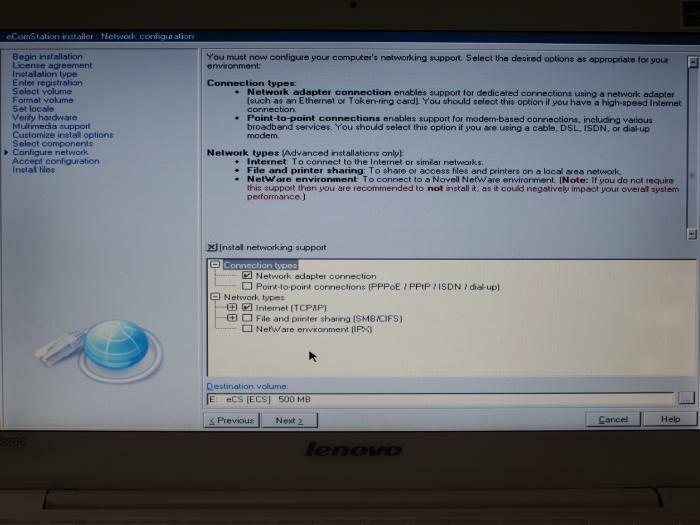 And shows you to get "dual boot environment" which can use pre-installed OS(Windows). Also, this tutorial may apply to other computer system. At first, you need some utility softwares and tools. For example, I use "Acronis Disk Director Suite" as HDD disk dump editor and HDD partition editor, "Acronis True Image Home" as backup software, and also USB HDD as backup media. Also, you need USB DVD drive. DVD Drive have to have a "write" function. Read-only drive(e.g. 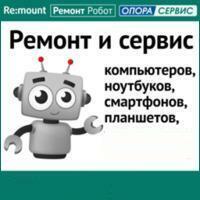 :DVD-ROM drive) is no use. At first, you must make a recovery media. 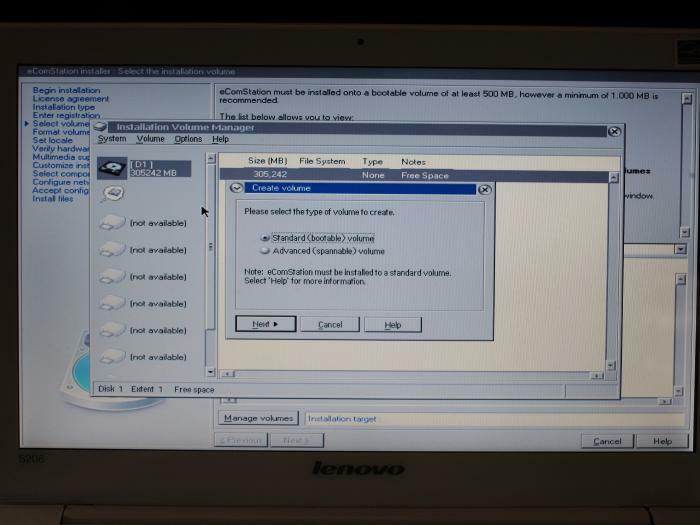 Start Windows OS and create recovery DVD. The eCS installer can not recognize default HDD partition. So you have to re-create it again. 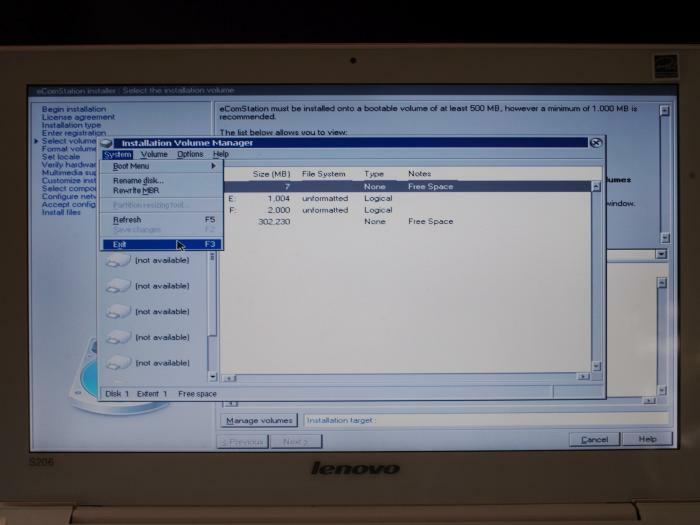 The default HDD partition is as follows. 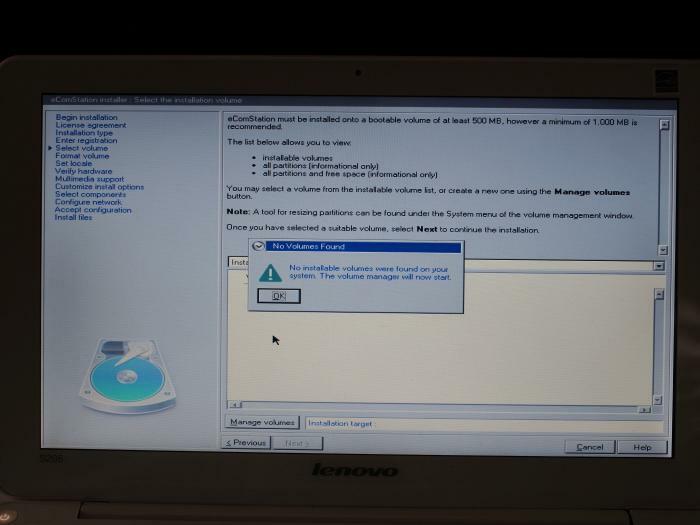 I do not want to change the default HDD partition. I hope to add a eCS volume to this partition. Accordingly, my HDD partition planning is as follows. On eCS, a drive letter is assigned as follows. A young drive letter is assigned to primary partition. 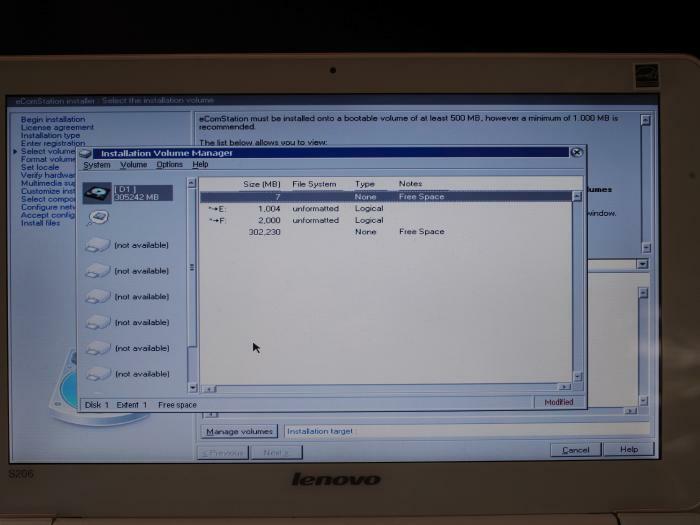 A partition named "LENOVO_PART" is OEM partition(hidden partition). The drive letter is not assigned to it. A drive letter which assigned to logical volume is after primary partition. Finally, you should decide volume space used by eCS and data partition. e.g. My partitioning is as follows. During installing eCS, you have to take a note of partition table and edit it. 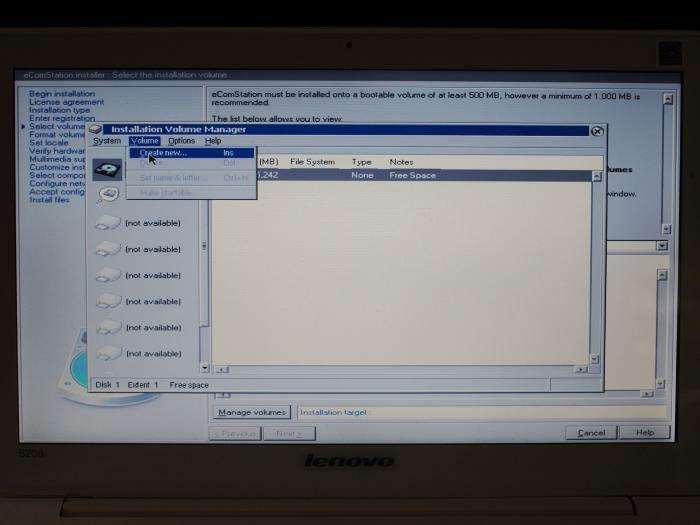 You can view the partition table in Master Boot Record(MBR) using HDD disk dump editor. The MBR appears at first 512 sectors on HDD. The partition table starts at 446 bytes on MBR. There are 4 partition tables in MBR. 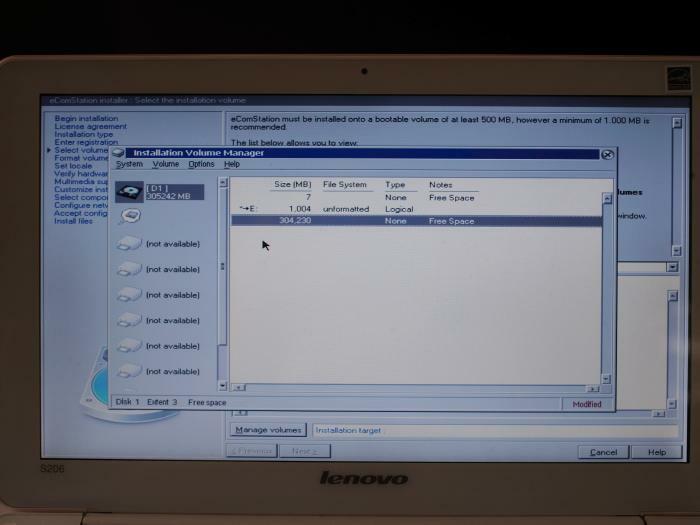 Partition table shows us that where the partition is allocated on HDD. 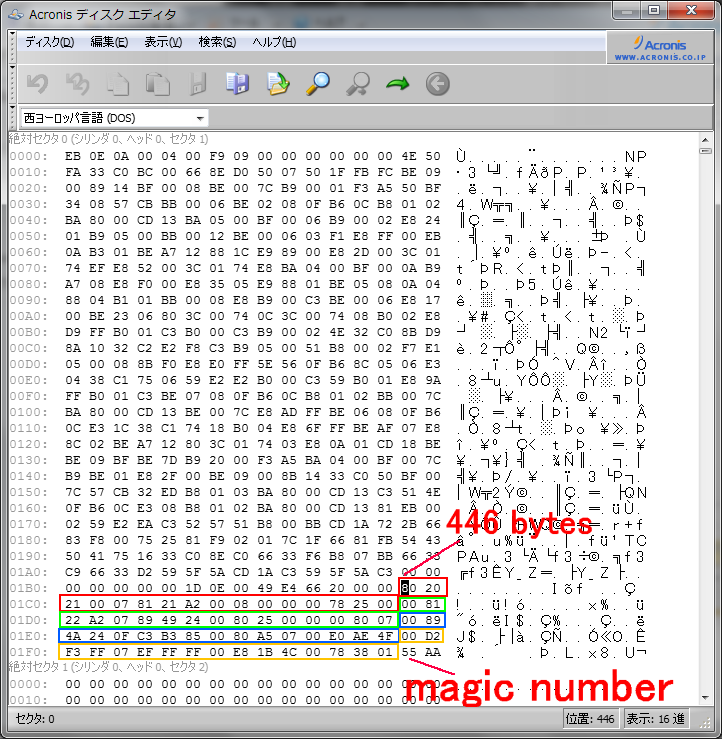 After the 4th partition table, there are 2 bytes of data called "magic number". It shows to system where MBR is end. Do not change the magic number. It makes starting of a system go wrong. If you want to learn more about boot sector, you should search it on the internet. There are a lot of informations about it. e.g. 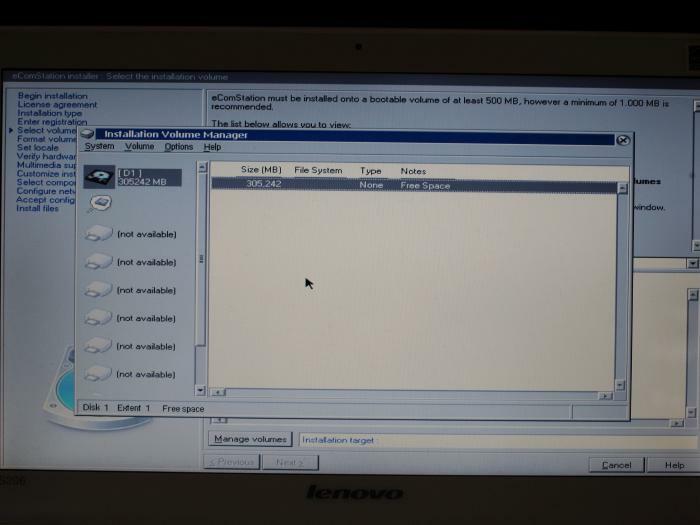 On "Acronis Disk Director Suite", boot from bootable cd and select [Edit Disk] on the menu. Here are sample of my default partition table. At first, you must create partition to install eCS. 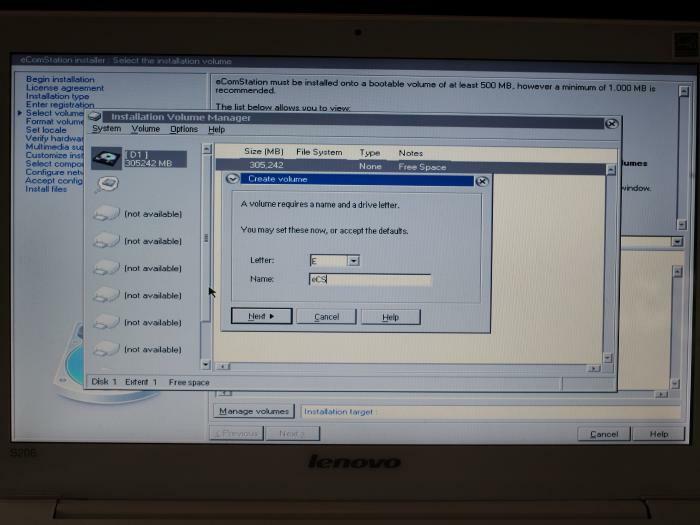 Use HDD partition editor and create free space at start of HDD. The HDD partition looks as follows after you created the partition. The free space which you should create needs more than space for eCS and user data. 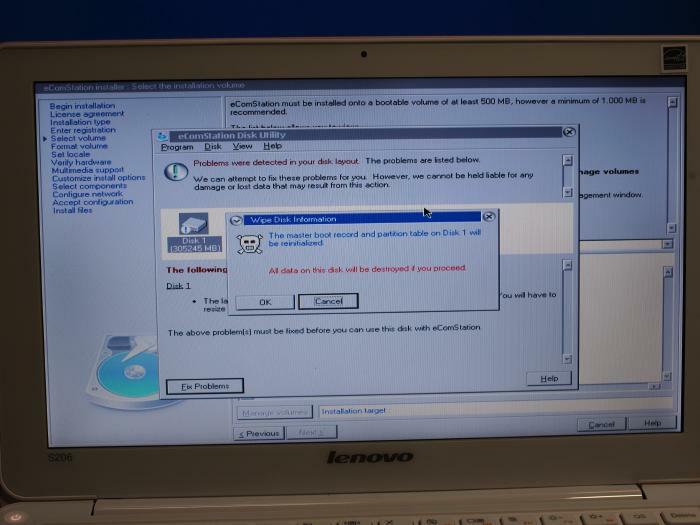 To create free space, resize "Windows_7" partition. Don't touch to any other partition. 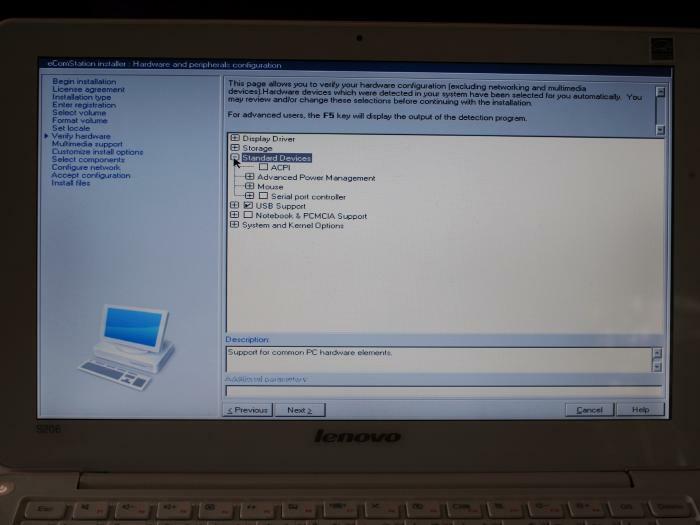 After installation partition is created, you must take a note of partition table. 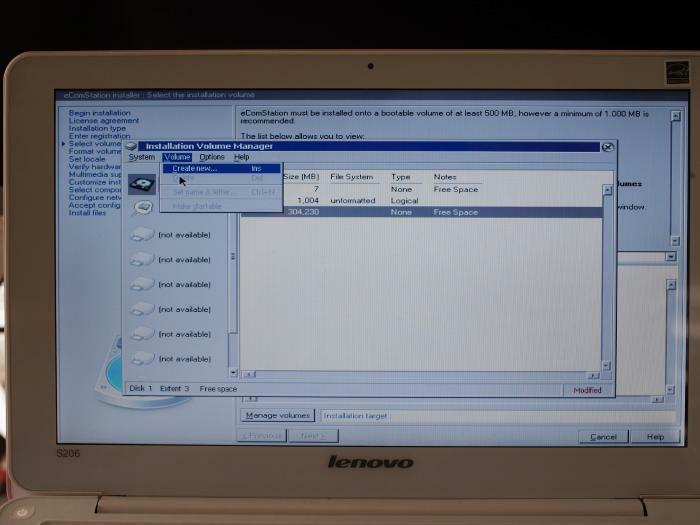 Use backup software and make a backup of "No label" partition. 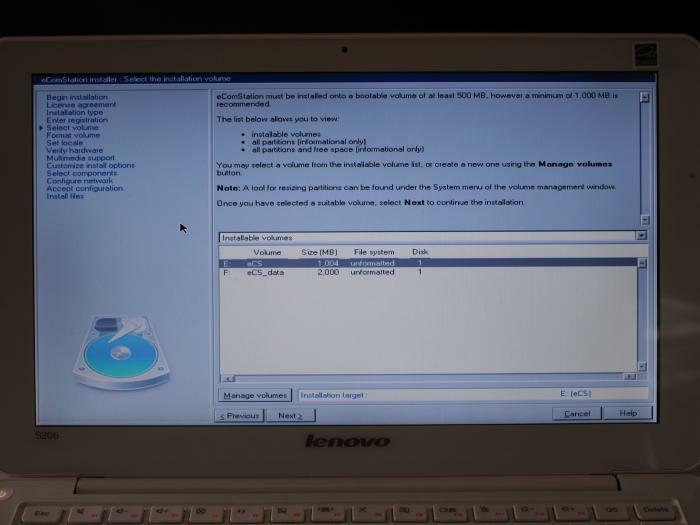 Set eCS bootable media to USB DVD drive and boot from the media. 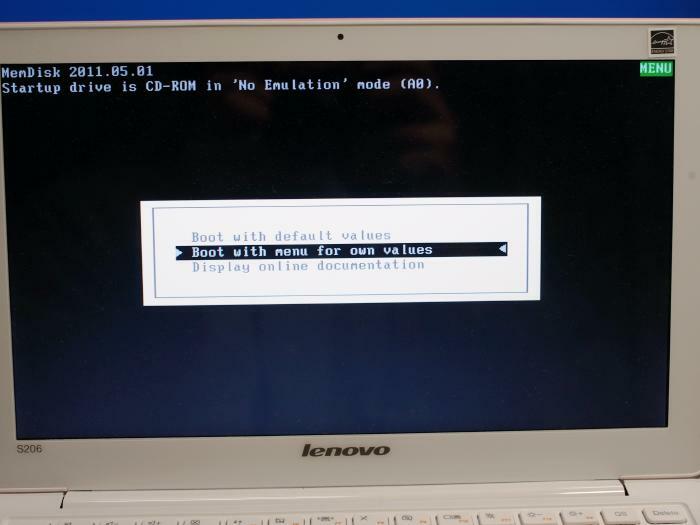 To install eCS from USB DVD Drive, you must select "Boot with menu for own value" from menu. 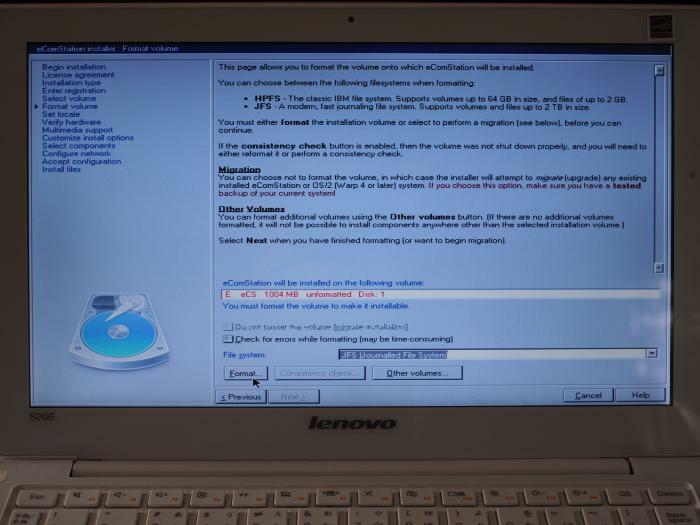 In the boot option menu, select "CD-ROM/-R(W) drives attached" and check a "Install from USB CD device". Continue the installation process. A warning message will appear. 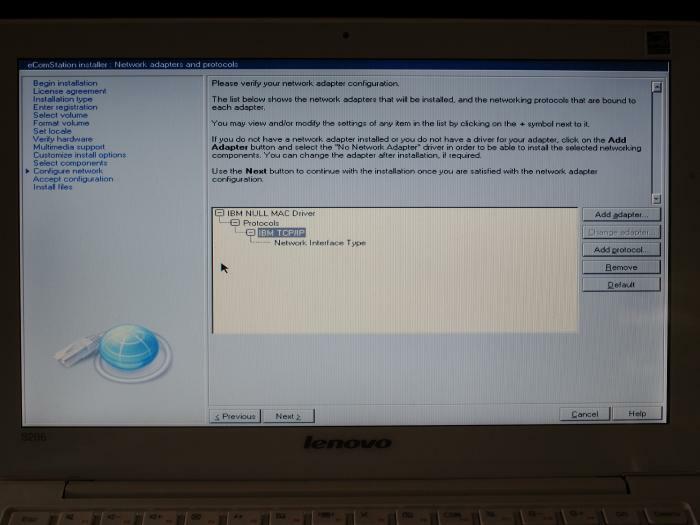 Select [Disk]-[Wipe disk information]-[MBR and partition table] from menu bar. 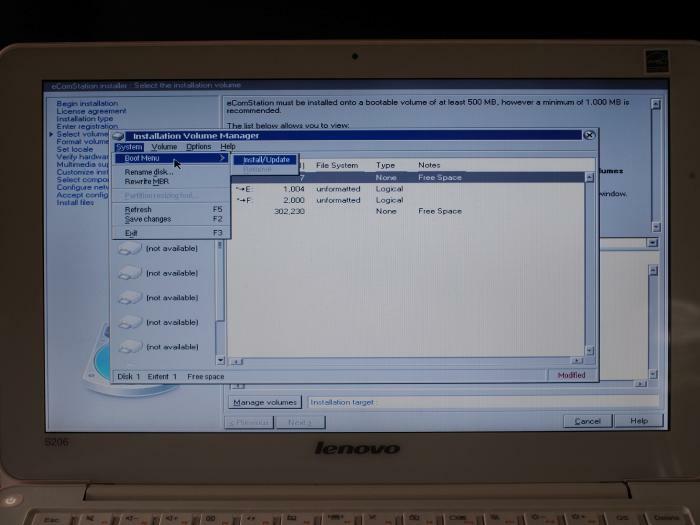 After this operation, the partition on the computer is all removed but the data still exist there. Reboot computer. Then you restart installation process. At this time, no warning message will appear. Select [Volume]-[Create new...] from menu bar. "Create volume" wizard will start. 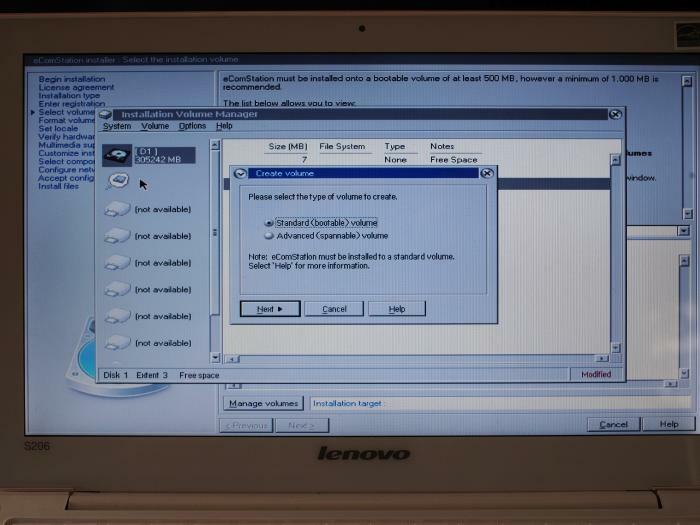 Select "Standard(bootable) volume" and click [Next] button. Select "E" from "Letter" pull down menu. "Name" is optional. Enter "volume size". Un-check "Use primary partition" and click a [Finish] button. A volume "E" is created. Also a free space which used 7MB HDD space is created too. I don't know why a partition called "free space" is created at first area of HDD. I think this is remains of "Boot Manager" used by legacy OS/2 system. Anyway, the partition takes no impact on using system. So I recommend "don't touch" for this partition. Choose free space and select [Volume]-[Create new] from menu bar. 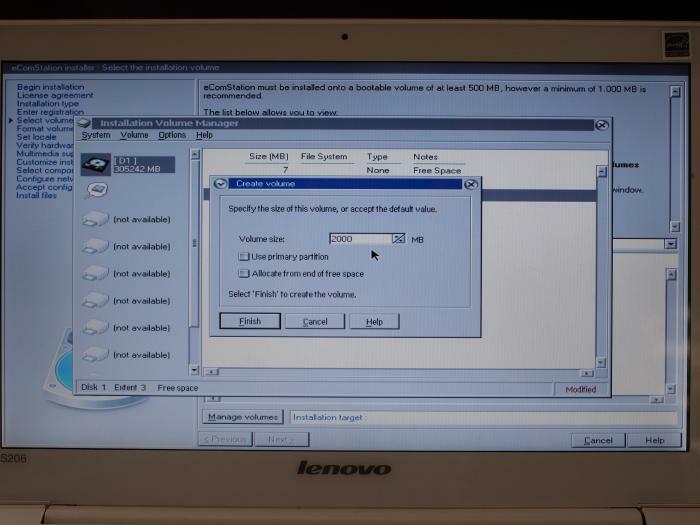 Select "Standard(bootable) volume" and click [Next] button. Select "F" from "Letter" pull down menu. "Name" is optional. A volume "F" is created. Select [System]-[Boot Menu]-[Install/Update] from menu bar. Select [System]-[Exit] from menu bar. Installable volume is created. Continue the installation process. Don't choose "ACPI" option at this time. It causes system stop in boot progress. If you want to use "ACPI", install the latest driver after eCS installed. Select "Universal Audio Driver" for audio device. 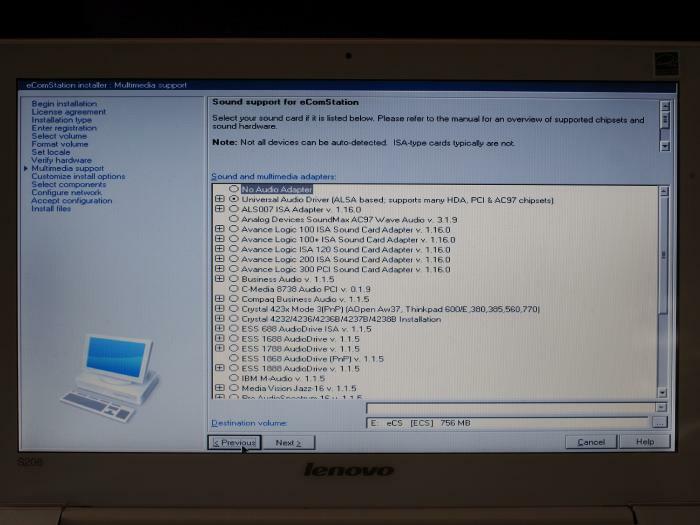 Ideapad S206 has Ralink 3090 wifi adapter. It is not currently supported under eCS, but I install network support option for the reason that I expect it will be supported later. No network adaptor is detected. Click [Add adapter...] button. At this time, I installed "IBM NULL MAC Driver". 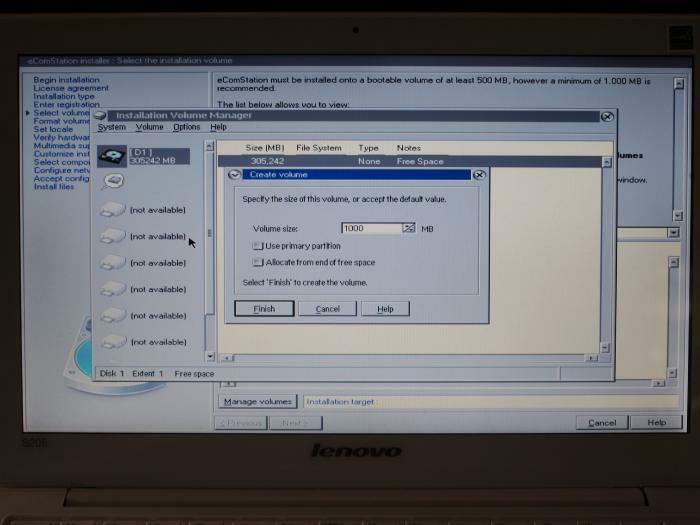 If the dialog as follows appear, select USB DVD device. 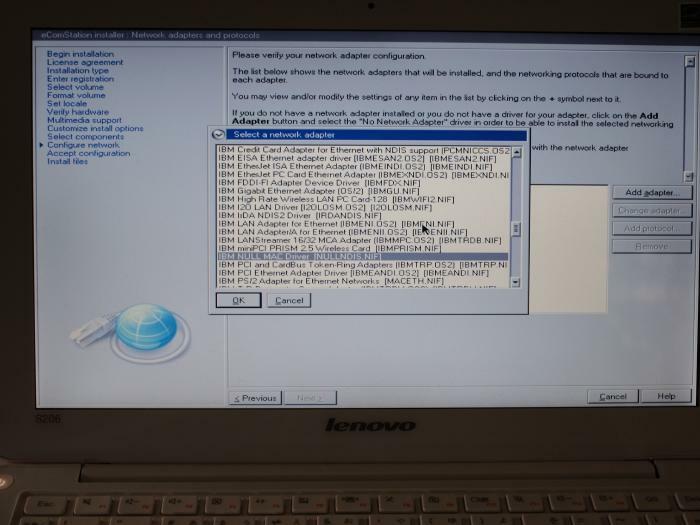 Then installer will continue and all will be done correctly. 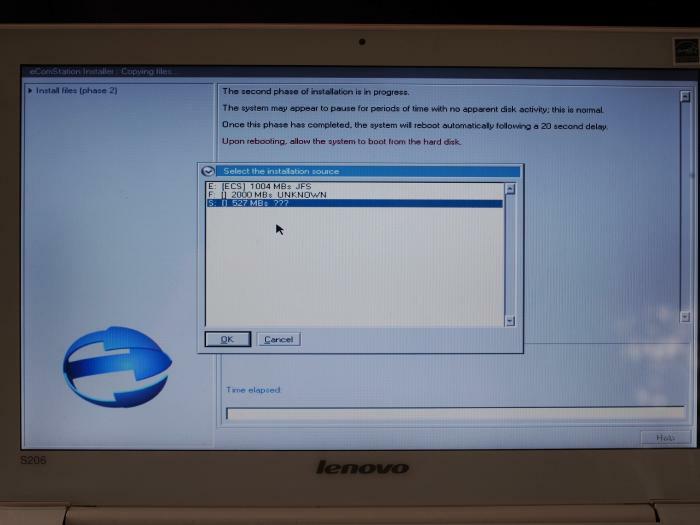 After installation is completed, the system partition looks as follows. 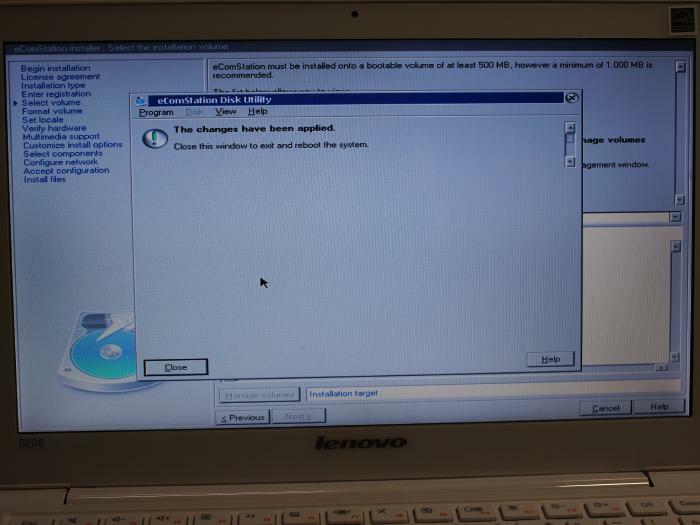 note: why windows parition disappeared? 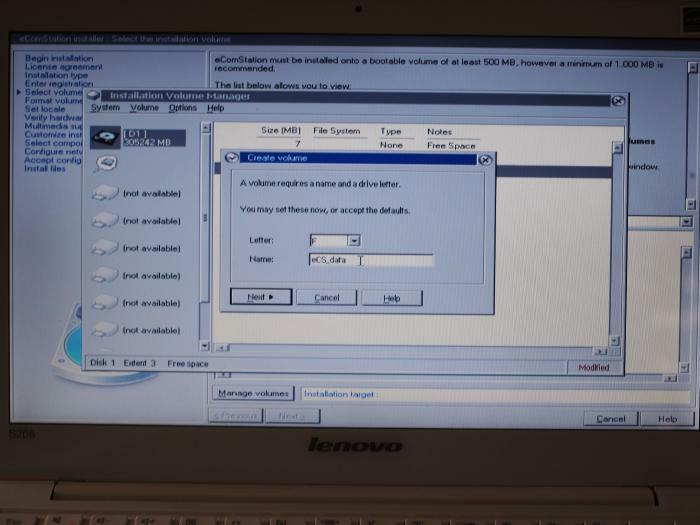 Remember that you cleared partition table at installation process step 4 . 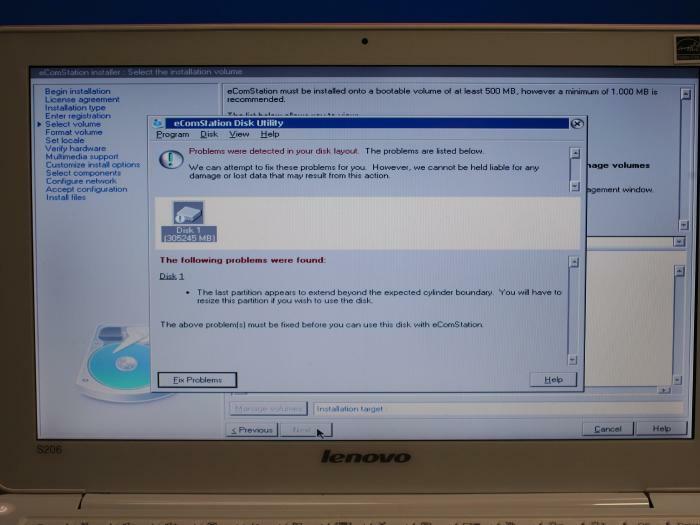 After this operation, the partition table is "Zero cleared". 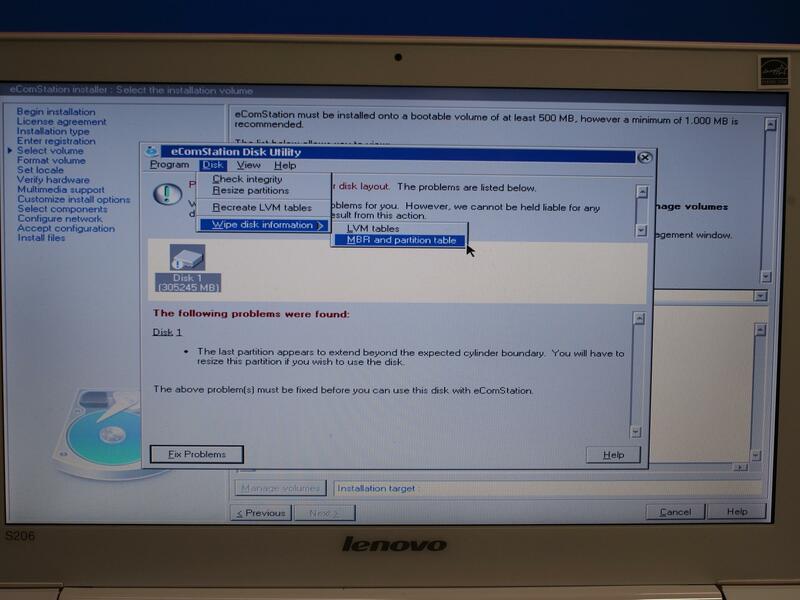 This is why the system dismissed Windows partition after recovery eCS. Here are sample of my partion table. Edit parition table. re-input the value which you took a note before. 00 00 01 01 05 fe 7f 7f c1 3e 00 00 bf e2 5d 00 <- don't edit! 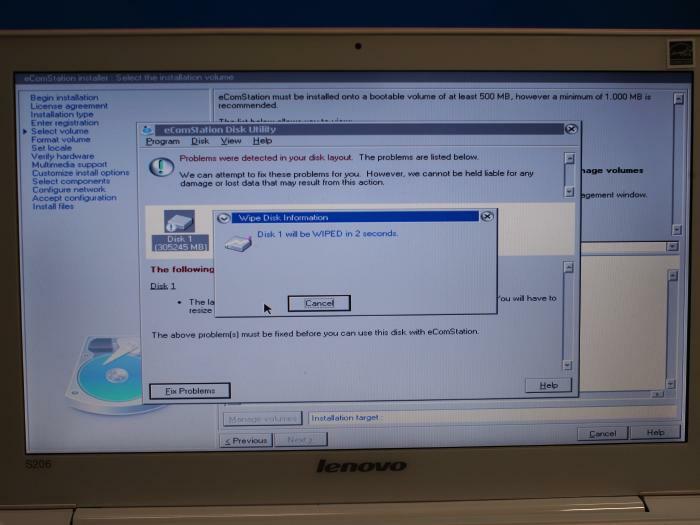 After done this operation, the Windows partition appears again. 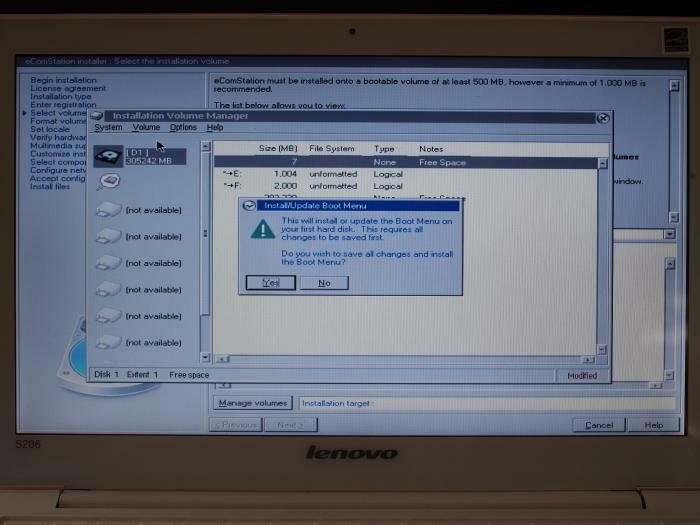 Recover "No label" partition to third free space on HDD. Now, you should have partition as follows. Finally, use partition editor and resize "Windows7_OS" partition. 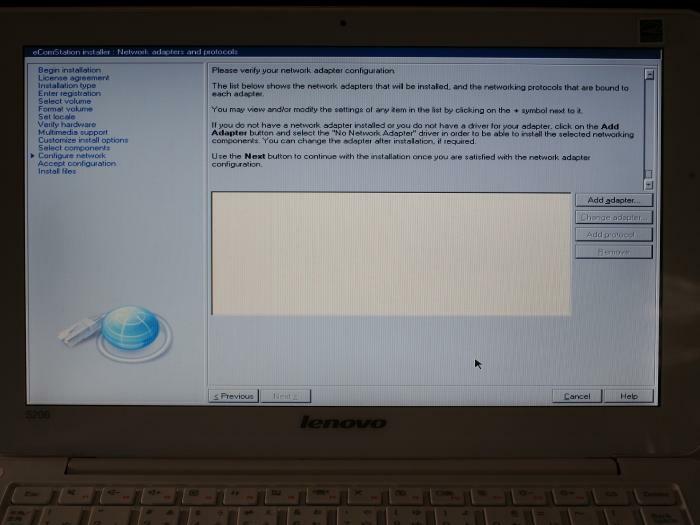 The second "Free Space" partition shall be take in to "Windows7_OS" partition. The existent "Free Space" on start of HDD is not used. Maybe it can take in to any partition, but I don't touch it. Anyway, its used space is only 7 MB and not of care. At now, all of installation proccess is done. Enjoy your computer life! Currently wireless lan is not worked on eCS.